The SPF rating on a sunscreen bottle stands for Sun Protection Factor, a measurement of how long you can stay outside during the day and be protected from the sun’s burn-causing UVB rays (assuming you’re applying sunscreen the right way). UVA rays are present, too; this is where the PA+ rating system comes into play. Some sunscreens include PA+ rating on their products. The letters “PA” followed by plus signs (PA+, PA++, PA+++, and PA++++) on a label are a rating system developed in Japan to represent how much UVA protection the product offers. The sun’s UVA rays do not cause sunburn; rather, they cause skin to turn brown. UVA rays are known as the sun’s silent killers because you don’t feel them affecting skin. Despite the lack of pain associated with UVA rays, they penetrate deeply into skin, causing a somewhat different type of damage than UVB rays. As helpful as the PA rating system may seem, there are drawbacks that make it questionable in the long run. First, not all countries agree with how the PA measurement values are achieved. The primary issue is that the PA rating measures only how the sun’s UVA rays cause the skin to become brown and stay brown, a process called Persistent Pigment Darkening, or PPD. The problem is that not everyone’s skin turns brown from being exposed to the sun, especially when exposed only to the sun’s UVA rays. In the actual testing to determine the PA rating of a sunscreen, the color of different people’s skin after UVA exposure is inconsistent; some skin gets darker, some not as dark, and some take longer than others to turn brown. The PA rating also is not related to time as the SPF numbers are, which causes a great deal of confusion as to what the PA+ actually means. In other words, no one knows how long the PA rating lasts from person to person in real-world use. Regulatory agencies in most countries, especially in the European Union (EU) and in the United States, use the SPF ratings to include both UVA and UVB protection. This process more accurately represents a real-world experience of how people’s skin responds when exposed to the sun, not just UVA or just UVB. In these countries, the term Broad-Spectrum Protection is on the label to indicate that the product has passed testing to show it protects from both UVA and UVB damage. 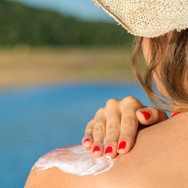 Scientific data demonstrated that products that are “Broad Spectrum SPF 15” [or higher] have been shown to reduce the risk of skin cancer and early skin aging when used with other sun protection measures, in addition to helping prevent sunburn. Whether a sunscreen uses the PA rating system or not (and it’s definitely neither essential nor a mark of a superior product), a well-formulated sunscreen will provide broad-spectrum protection and, as with any sunscreen, must be applied liberally and reapplied as needed to maintain protection.